HARLEM — It's the story of Harlem told through a time-traveling boy and his horse. A series of holiday storefront window displays will take shoppers and tourists through the different eras of the neighborhood, telling a story at each business. The story of Chaz, an 11-year-old, time-traveling boy, will start in the 1920’s and follow him as he jumps around to different historical periods, including the Great Migration, the Harlem Renaissance, the return of the 369th Infantry Regiment, aka the Harlem Hellfighters, the Civil Rights Era and the Soulful 70’s, Orange added. Some windows will have inspiring quotes by famous Harlem figures such as Langston Hughes and Zora Neale Hurston. It's something that Orange has been wanting to do for years and was finally able to pull off with help from the Harlem Tourism Board, which is sponsoring the event, and other local organizations. Shoppers will be able to take a self-guided tour — which spans about a mile and a half from 113th Street and St. Nicholas Avenue to 125th Street and Lenox Avenue — and follow the story by reading QR codes on their phone. They can also go on a guided tour in which off-Broadway actor Daniel Carlton, who wrote Chaz's adventure, will perform the story. Guided tours are $20 for adults and $5 for children. “This idea of telling a story we thought is kind of like we are creating a crawl concept like we do with the art crawls," said Nikoa Evans-Hendricks, founder of Harlem Park to Park. The tour will officially kick off Dec. 9, at 110th Street and Fredrick Douglass Boulevard where there will also be a tree lighting ceremony. There will also be a free guided tour that day, Orange said. Both the tree and the window tours will last until Jan. 5, 2015. Local artists are designing the eight displays. The ones on Land Yoga and Lido Harlem are already visible. Other participating businesses include Barawine, the Cecil, Harlem Shake, Seasoned Vegan, Vinateria and Cohen's Opitacal, Orange added. 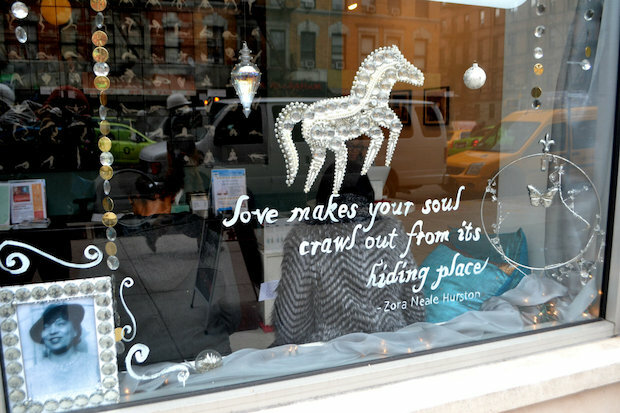 The idea of brining window displays to Harlem has been around for a couple of years. In 2011, Harlem Park to Park, had a window display contest with several local businesses. But there hasn't been anything like it since, Evans-Hendricks said. "We’ve been trying to get back to it the last couple of years,” she added.